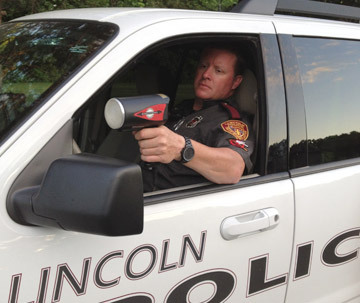 Speeding is a national problem and the Lincoln Police Department is committed to protecting the safety and quality of life for all residents. It is the desire of the Town of Lincoln to promote the safe movement of traffic within and throughout all of our neighborhoods. This is accomplished by using the three "E's" of traffic calming: Education, Engineering, and Enforcement. A traffic safety program must involve cooperation and communication with the community. The program must address the public attitude, personal behavior, road design, safe and reasonable speed limits, and enforcement. If you believe there is a speeding/traffic safety problem in your neighborhood or street, please pass this information onto the traffic safety officer. This can be done by mail, e-mail, or telephone. Some helpful information that should be included would be the nature of the complaint, the time of day/night the violations occur, and any other information that would assist officers when addressing this concern. It would also be helpful if you gave contact information so that an officer could discuss the problem with you. As an additional service to our community please click on this link for the Traffic Calming Request Form.